A few weeks, or was it maybe a couple of months ago, Maria from Cult Nails announced that they were going to have a special collection for their 2 year anniversary. Not many details were given I think. Or maybe my stalking skills aren’t that good yet. LOL! Anyways, Maria just annouced the new collection today! There will be 3 polishes in this collection: Tempest a high gloss self leveling white; Blaze a glowing gold and copper glitter; and Fetish a wax look finish! And you know what the best part of this Anniversary Colletion is? There will be a pair of earrings with every bottle of Blaze. There are 3 possibilities of earrings that you might get. C) a pair of 1 carat genuine diamond earrings!! I am not kidding!! Pop by and read their blog post if you do not believe me! Did I mention that these polishes will be at a special price too? $30 for 3 bottles, which is more than a 15% discount! AND free shipping on all orders above $50. Even international orders! What are you waiting for? Hurry on and buy yourselves a pair of diamond earrings! and if you do not like them I am happy to keep them for you. 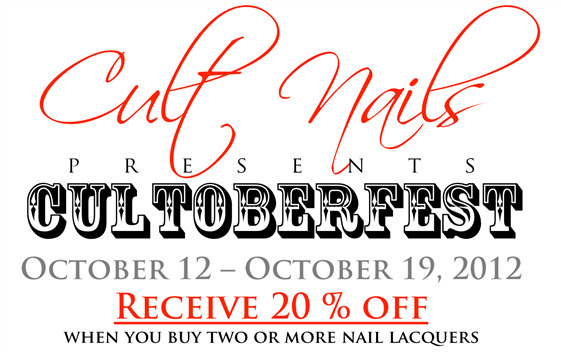 Flash Sale at Cult Nails! Click on the photo for more details!! I have a few last minute Cyber Monday Sales to share with you today! Most of them are nail polish related and maybe some not really nail polish related. Illamasqua is giving away a free nail polish with every order this week? They are even offering free shipping on international orders above £35! They are also offering Limited Edition Gift Sets for the Holidays! This email came in this morning!! All you need to do is to key in the code CULTOBER upon checkout to get this discount. How easy is that right? Mystery Bags up for grabs at 365 Days of Color!! How I wish I wasn’t on a No-Buy this month! 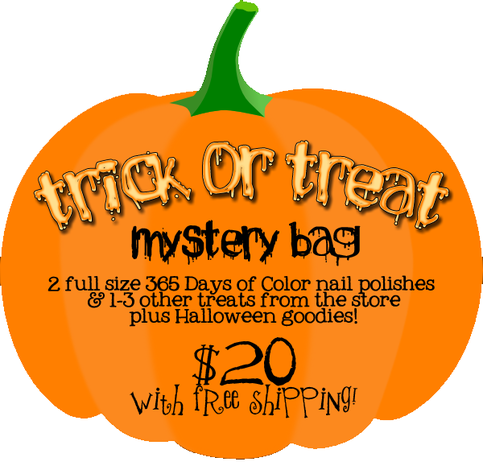 Sunny from 365 Days of Color is having a Halloween Mystery Bag offer at her shop! For just $20 you get 2 full size polishes and 1-2 random gifts from her line of products as well as other random goodies. And the best part of it all – Sunny is offering free shipping for the Mystery Bags to everyone! Even the international ladies. There are limited quantities of the mystery bags up for grabs which means I definitely would have to sit this one out. I have seen Sunny’s Halloween collection and am loving Boouk! and I Smell…Children!